While the balanced proportions of this face shape make it universally flattering, walnut-shaped eyeglasses perfectly complement this silhouette. If your face is wide at the top, but narrow at the bottom, you have a heart-shaped face. Choose bottom-heavy frames to balance out the proportions. You may also enlist the help of your eye doctor for more options. This face shape is characterized more by its length than its width. For this reason, aviator frames are most suitable as these add dimension to the face. The features of this face shape include a prominent jaw and a broad forehead. Narrow and thin frames help soften the angles of this face shape. Prominent cheekbones coupled with a narrow jawline and forehead make a diamond-shaped face. Choose frameless glasses or cat-eye frames for this shape. As round faces have little to no angles, try angular eyeglasses with clear bridges. For the inverted heart-shaped face, pick top-heavy frames in bold colors. Another factor to consider when choosing eyeglasses is your skin tone, for which there are two categories: warm and cool. Warm skin tones have yellow, golden or peach undertones while cool complexions have pink or blue undertones. In general, warm skin tones look best with gold, copper, peach and camel brown eyeglasses. Silver, pink, black and blue frames are most flattering on cool skin tones. The process of getting your eyeglasses doesn’t end after the eye exam. 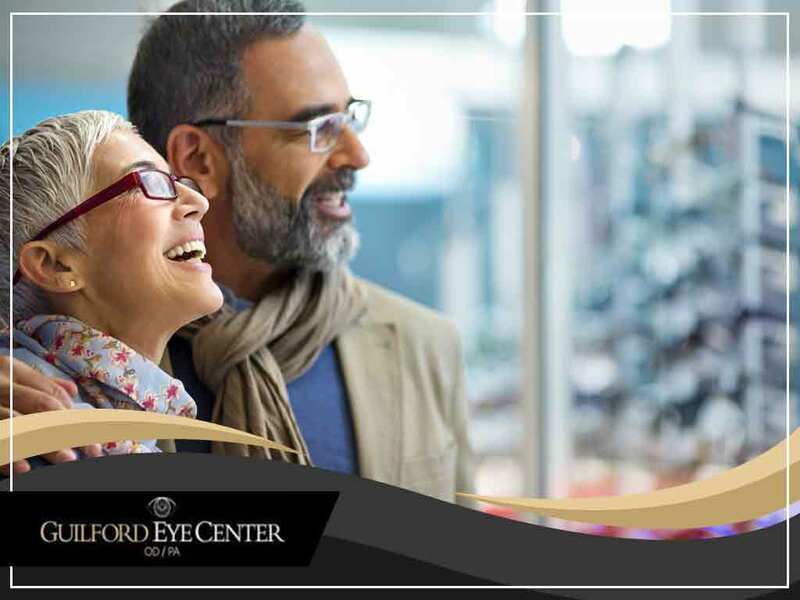 Guilford Eye Center offers a wide range of eyeglass styles to suit any face shape and skin tone. You may call us at (336) 387-6777. We serve Greensboro, NC.